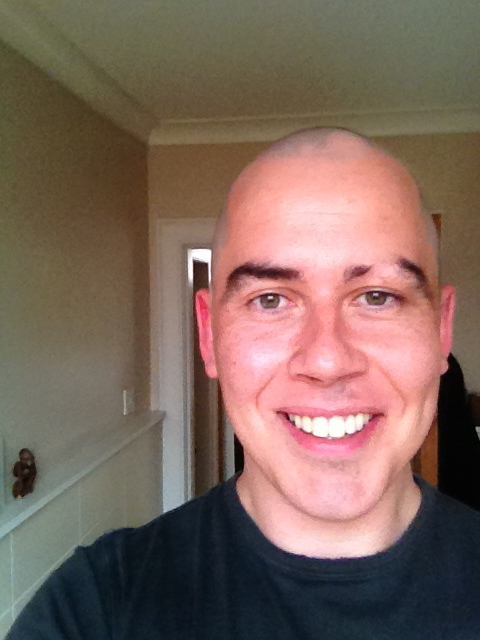 My name is Reece, I am in my mid thirties, live in Scotland and have had Alopecia Areata for about a year. It started off as two spots on my beard and progressed. Currently the (bald) patches have crept over, bled into each other and covered most of my face and the majority of my head. I have 1.5 eyebrows and one full set of eyelashes! All in all I am quite a catch! You know that saying – “sometimes you’re the dog, sometimes you’re the lamppost“? well sometimes I feel like the dog (with mange) and get down. However most days I get on with my life and feel like a lovely bald lamppost. I never thought in a million years I would be writing a blog related to helping others. My friends would probably have described the ‘old me’ (the one with hair on his head) as a selfish, materialistic person in the past. I believe that living with (and more importantly accepting Alopecia Areata, has given me more empathy, strength and made me a fully fledged nicer person! But then again I would say that. Don’t get me wrong – I still poke fun at others, am certainly nowhere near a saint (like at all!) and can be a foul, grumpy sod at times. However my personality and attitude may have changed but that isn’t why you are here. Hopefully you have come across this site as you have been frantically searching for ‘alopecia’ ‘alopecia recovery’, ‘how to deal with alopecia’ etc etc. This site is intended to help those of you who are feeling desperate, unsure or inquisitive about what having Alopecia feels like and how it impacts upon your life. Its not all sunshine and roses but there is a light at the beginning/middle/end of the tunnel – if you choose it and depending on where you are in your head (and of course on your head). The main thing I have learned from this ongoing experience is that it shifts and changes all the time. Refuse to be bogged down by negativity or stress. Find your coping mechanisms and seek out people who can help you feel good about yourself. Get in touch with me if you want to chat – like I said – I am starting this to make people feel better and put some more information out there. I was so sick of searching the internet for real people or positive stories. Instead all I found were a number of negative stories and hundreds of people trying to sell me hair regrowth products or peddling some old miracle cure. In my opinion, these charlatans are disgusting and prey on weak and desperate people who would do anything to change their current situation. I should know – I was one. And I totally understand if you feel the need to try all of the remedies. They didn’t work for me – but who is to say they may not work for you. Nobody has the cure unfortunately. If they did – they would be a millionaire. I promise that this blog will not try to sell you hair regrowth products or make you feel crap about yourself. I have to say that this is the first site I’ve seen that actually made me feel better about this whole alopecia thing. You hit the nail on the head with the emotional feelings that you’ve expressed, the things you’ve said on here have definitely put a positive edge on what I’ve been feeling lately. My first go round with this was about 10 years ago on a single spot on my head, thankfully, the Cortizone treatment worked and it grew back fairly quickly. About 6 months ago, however, my beard stared doing the same thing yours did, and in about 3 months doubled in size. It’s spared me for the time being and still let me keep my handlebar mustache (for now lol) but you can imagine that I’m concerned, especially already having gone through it once. Either way, things like your blog are definitely something we need more of and I think you’re an amazing dude for making people going through this more comfortable and positive no matter what the out come might be! Thanks for the awesome blog and giving me a much needed boost of reassurance! And thanks for helping people keep there heads up, bald or not!!!! Hey Robert – thanks for your feedback! That’s why I started this blog – couldn’t find anything to help me and I friend suggested I document my journey and share it. Nice to hear it’s appreciated. Do you have an email address we can contact you on?